Looking at the WHO growth standard for MUAC, one can understand the change of MUAC with age. So my concern is, is it feasible to use the same MUAC cutoff (<11.5CM) for all children aged 6-59 months to screen SAM? My understanding from field observation is that its sensitivity for younger children aged 6-23 higher than its sensitivity for older children aged 24-59. In order to have similar sensitivity one can assume a lower cut off for younger children and higher one for older children. Looking for your thoughts. This question comes up from time to time on EN-NET. Age-independence is a useful attribute of a SAM case-definition. When you look at MUAC in children you can see that it increases with increasing age quick quickly before 12 months or age and more slowly afer that. MUAC is, therefore, not independent of age. This is what you observe and comment upon. The issue is, however, a bit more complicated than this. Therapeutic feeding programs, are, I think best understood as child survival programs. We treat SAM to avoid death not to treat thinness. In this case we would be most interested in the relation of an indicator to mortality risk. For MUAC we see that fixed MUAC thresholds have similar mortality risk over a wide range of ages. This is not universally the case with (e.g.) W/H. MUAC does select more younger children than older children. This is not a flaw. It is what we want because the younger children selected are at higher near term mortality risk that can be reduced by therapeutic feeding. A simple single threshold allows programming with community-based volunteers doing case-finding and mothers doing MUAC at home. This allows high spatial and temporal coverage of case-finding activities that are not possible with other indicators. See this article for a discussion and review of SAM case-definitions. A very interesting question and answer that is always raised also by students I teach. I fully understand Mark's answer. But we do agree that there will be more false positives amongst the younger ones that are included because of <115 mm but would not have a higher mortality risk necessarily. Correct? I am not sure I quite understand the question here. Fixed MUAC thresholds have similar mortality risk over a wide range of ages. This means that the we should see a similar false positive rate over a wide range of ages for a fixed MUAC threshold. I do not think that "there will be more false positives amongst the younger ones". Am I missing something imprtant here? I'd like to pick up on "false positives" ... I like to think of this as a "provider error". By this I mean that the provider uses resources when they may not be needed. Such an error is in favour of the child. I do not mind making this error as much as I mind making the opposite error (i.e. to refuse resources when they are needed). From this perspective "false positive" errors are benign errors. Briend A, Zimicki S. Validation of arm circumference as an indicator of risk of death in one to four year old children. Nutr Res 1986;6:249–61. Rasmussen J, Andersen A, Fisker AB, Ravn H, Sodemann M, Rodrigues A, Benn CS, Aaby P. Mid-upperarm-circumference and mid-upper-arm circumference z-score: the best predictor of mortality? Eur J Clin Nutr 2012;66:998–1003. I am confused too by concern about “false positive” raised by Mija. In the context of risk of death assessment, false positive are children selected by MUAC who would survive in absence of intervention. When the objective is to reduce mortality, it is necessary to use high cut off which will be associated with many false positive based on this definition. This is not a real concern: there is no more false positive under this definition in young children as mentioned by Mark. This risk approach leads to the selection of children who are quite different from the traditionally used normative approach which selects children deviating from the WHO standard. The discrepancy between the two methods has been a topic of discussion for the last 20 years at least. The main questions to raise when choosing between the two methods is: what is your priority objective ? do you want to prevent death ? Or to have children be within accepted deviation of growth standards ? Dale NM, Myatt M, Prudhon C, Briend A. Using mid-upper arm circumference to end treatment of severe acute malnutrition leads to higher weight gains in the most malnourished children. PLoS One. 2013;8(2):e55404. Fabiansen C, Phelan KP, Cichon B, Ritz C, Briend A, Michaelsen KF, Friis H, Shepherd S.
Short children with a low midupper arm circumference respond to food supplementation: an observational study from Burkina Faso. Am J Clin Nutr. 2016 Feb;103(2):415-21. A paper by Fabiansen et al, about to be published will even show with body composition data (using D2O dilution technique) that treated short children mainly put on lean tissues and that the concern of making them fat by treating with RUTF them is totally unfounded. 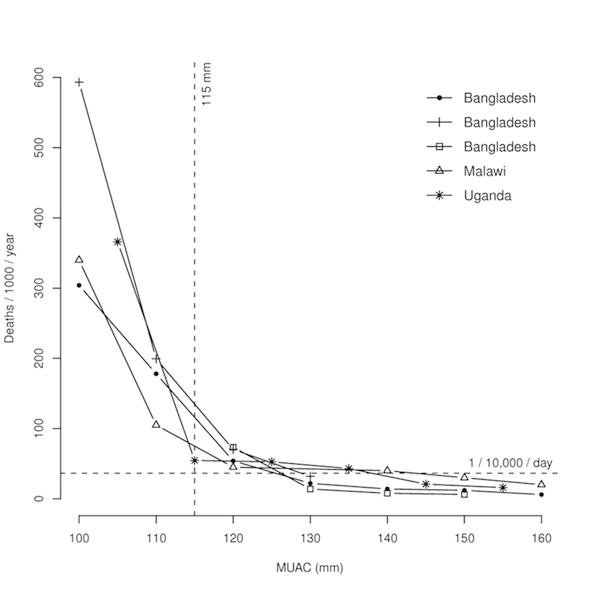 The practice of using a minimum height to eliminate young and stunted children when using MUAC should be abandoned. A more genuine concern re. the use of MUAC uncorrected for age is the upper age limit to which it can be applied. Clearly the current cut off of 115 mm cannot be used in adolescents or adults. What to do after the age of 3 to 5 years is a current topic of research. Just to add to your last comment. The paper on the safety of MUAC discharge (below) also indicates that children identified by MUAC and with height less than 65cm were equally able to respond to treatment with RUTF as taller children. In that study 86% of the sample had a HAZ < -2 on admission. Binns, Paul & Dale, Nancy & Banda, Theresa & Banda, Chrissy & Shaba, Bina & Myatt, Mark. (2016). Safety and practicability of using mid-upper arm circumference as a discharge criterion in community based management of severe acute malnutrition in children aged 6 to 59 months programmes. Archives of Public Health. 74. 10.1186/s13690-016-0136-x. Another paper currently under peer review (Binns, P & Myatt, M) looks at children recruited with MUAC <115mm and who were short or stunted on admission and treated with RUTF until cure at MUAC >125mm. In that study no children became overweight or laid down any excess fat as defined by WHO standards. Though I am not the initial person who asked the question, I get very inspired by this debate and very good explanations. Much appreciated. I have then an additional question (and I am by no means a MUAC expert!). I always had understood that 115 mm as threshold was selected because of the steepness of the curve in relation to increased mortality (that's why the nutrition community shifted from 110 to 115 mm, correct?). So mortality increased tremendously at that threshold, more so than at 110 mm. My question then, if this is true, was this for all age groups the same, i.e. did the steepness of the curve increase for everybody at the same 115 mm? Briend A, Wojtyniak B, Rowland MG. Arm circumference and other factors in children at high risk of death in rural Bangladesh. Lancet. 1987 Sep 26;2(8561):725-8. This promising approach is currently further investigated. To my knowledge, no one looked at the curves relating MUAC to risk of death for different age groups. This may not be so easy to do because to look at this you need to break down the population in small subsamples and the association will be subject to a lot of random variation. In absence of effect of a correction for age on risk assessment, I assume the risk should be similar in different age groups. Bairagi R. On validity of some anthropometric indicators as predictors of mortality. Am J Clin Nutr. 1981 Nov;34(11):2592-4. By the way, this paper was the first to have shown the superiority of MUAC to detect children with a high risk of death. I did some work on this with the WHO and others almost ten years ago. I speak for myself here. My recall is that the shift from 110 mm to 115 mm was based on more than one consideration. Since CMAM is a child survival program we wanted high sensitivity as the consequence of missing cases is failure to prevent preventable deaths. This led us to a decision to revise the 110 mm threshold upwards. Each 5 mm increase in the threshold more than doubles the number of children identified. Selecting 120 mm would have resulted in a c. 500% increase in case numbers. This was too big an increase to argue for at the time for MoH delivered programming. This, and the pattern we saw in the plot (above) caused us to select 115 mm. Some NGOs (e.g. MSF) adopted the 120 mm threshold. Newer intervention models (e.g. COMPAS) use MUAC < 125 mm and vary treatment intensity by MUAC with good results and controlling costs, workloads, and crowding at delivery points. We could have chosen 116 mm or 117.5 mm but the convention is to use 5 mm steps and this was reflected in the mortality reports available to us. We were wary of squeezing out the middle (i.e. MAM) and had no remit to advise on revising case-definitions. We could, given sufficient data (now unethical to collect) have selected age-specific thresholds. This would have eliminated the simplicity which is a key feature of MUAC. Also, available evidence showed (and still shows) that adding age or height to MUAC added complication but did not improve case-finding sensitivity or specificity. Some of the work we did is covered in this report. Note that the recommendation to use proportional weight gain to decide discharge made in this report has already been overturned and MUAC is now used for this purpose. variables. Eur J Clin Nutr 1994; 48:189–97. rural Kenya: comparison of weight for height and mid upper arm circumference. Show that the predictive power of MUAC (i.e., the power of predicting mortality) is independent of age even in children below 1 year of age. Not so much THE history. Just a history from one person involved in the process for several years. I think the process was a rational one.